The Colorado Plateau is an otherworldly region of fantastic rock formations. Ancient seas laid down deep layers of durable sandstone. Geologic forces created uplifts, folds, swells, reefs and anticlines. Time, wind and water carved stone arches, needles, spires, fins, hogbacks, and countless canyons feeding the magnificent Grand Canyon. Sinuous river courses slowly etched downward sculpting deep, sheer-sided labyrinths of entrenched meanders with alcoves, overhangs and caves. On this backdrop of millennial rock ancient Native Americans created immense panels of outstanding artwork. 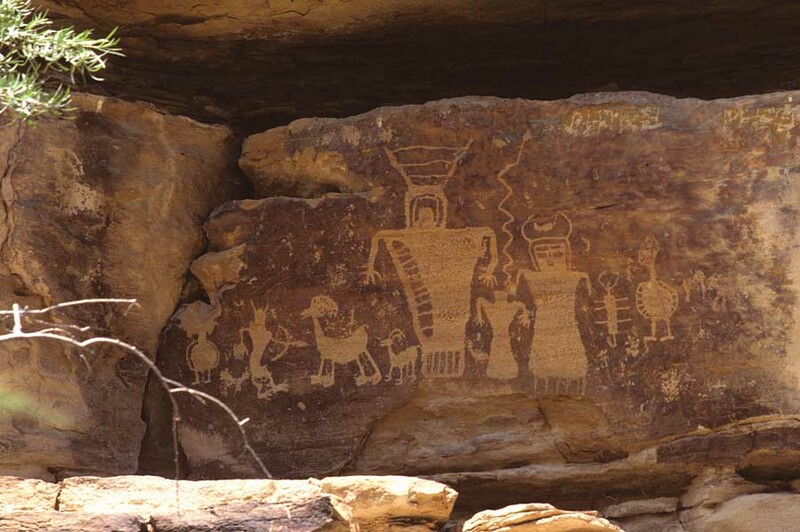 The Southwestern United States has the greatest concentration of prehistoric rock art in the Americas. 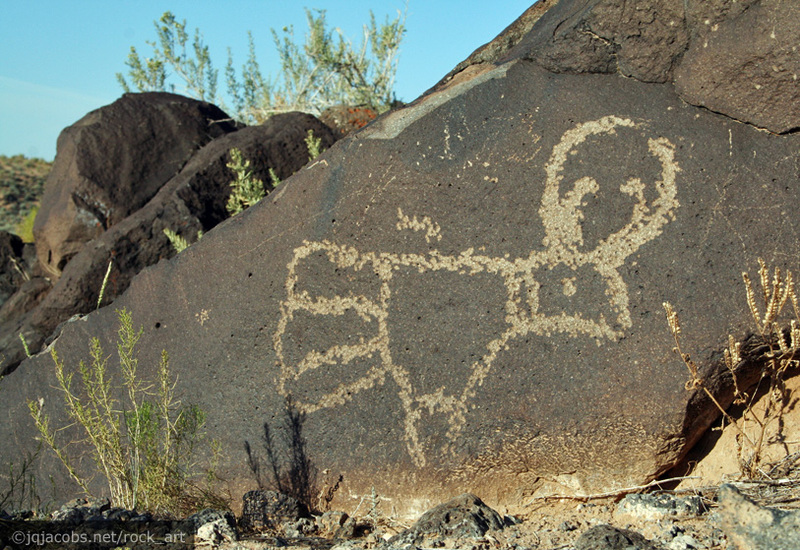 The dry desert environment of eastern Utah alone preserves an incomparable cultural legacy of more than 1000 rock art sites, some with dozens of panels and thousands of glyphs. 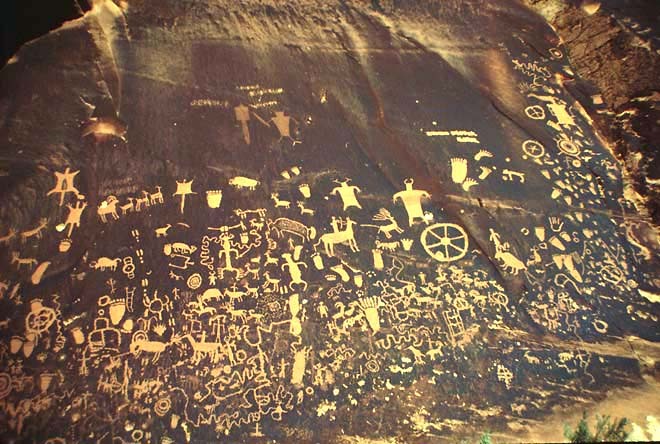 The oldest rock art in Utah with a known date is an incised pebble from an 8,700 year old level in Cowboy Cave. In 1957 Jesse D. Jennings dated the Archaic Native American culture to 11,000 B.P. in Danger Cave. Sites in Arizona, New Mexico and Nevada corroborate the antiquity of Archaic culture in the Southwest. 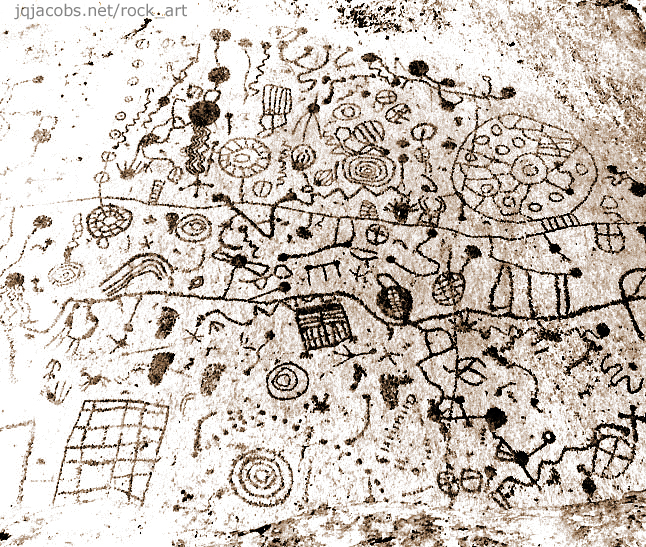 While some rock art may be as old as human occupation, almost all the art is attributed to recent millennia. View of Tablet Rock Panel and the Sierra Nevada Range. California. Tablet Rock glyphs. Inverted black and white image. Close-up view of the 23' x 17' petroglyph panel at Tablet Rock. 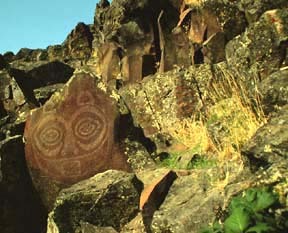 Paradise Creek petroglyph panel, Oregon. CLICK TO VIEW LARGER VERSIONS. Mastodons survive in Utah in the form of rock art. Paleontologists believe mastodons were extinct by 7,000 years ago. Their remains are still discovered today. At a great concentration of rock art near the Butler Wash-San Juan River confluence one panel includes a possible mastodon on the pectoral of a large anthropomorph (see photo thumbnail linked below). Above the Colorado River near Moab, on a sandstone fin, a 3 foot mastodon with upturned trunk is seemingly spraying its back with water. This glyph implies first hand knowledge of a living animal. The beast has a short tail and four toes per foot. 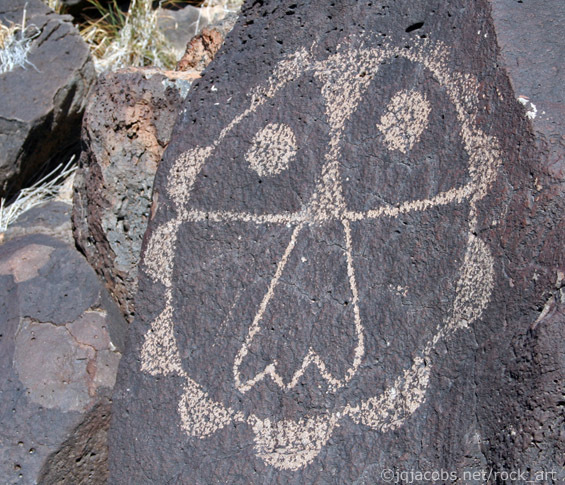 Rock art consists of two major categories, pictographs and petroglyphs. Pictography is the application of pigments. Survival of ancient paintings is attributable to use of mineral pigments, most commonly manganese, hematite, malachite, gypsum, limonite, clays and various oxides. The best preserved pictography is found under sheltering overhangs and in caves. The simplest pictographs are wet clay finger drawings and charcoal drawings. To produce crayons or paints first the minerals had to be finely ground and combined with binding materials. Crayons and animal hair brushes have been excavated in caves with paintings. Exceedingly fine lines evidence the production of excellent brushes. The most common rock art element found around the world, the human hand, exemplifies several pictography types. A technique used since the Neolithic is spraying around a hand, resulting in a negative image. The more common positive print was often made with pigment applied to the hand and transferred to the rock. Zigzags, lines and whorls painted on the hand provided variety. At Painted Cave, Arizona, (illustrated on the Puebloan Pictography page) more than 1,000 hand prints were painted directly on the rock, including a pair with six digits per hand. 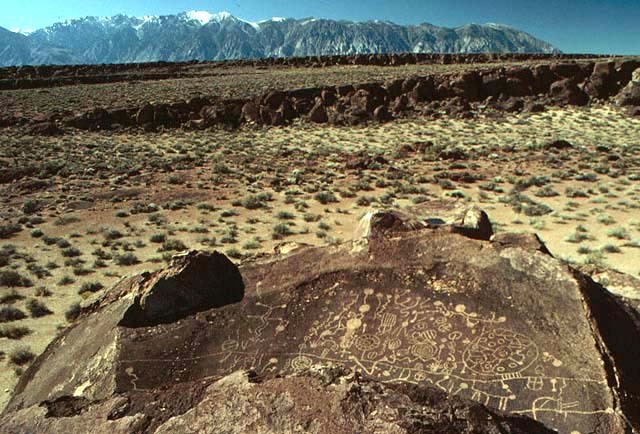 Petroglyphs are created by rock removal, including scratching, abrading, pecking, carving, drilling, incising and sculpting. Locations of choice are rock facets coated with patina, a dark mineral accumulation on rock surfaces. Petroglyphs remove the patina, exposing the contrasting lighter rock interior. Instances of negative images, produced by removing the patina surrounding the intended figure, are also known. 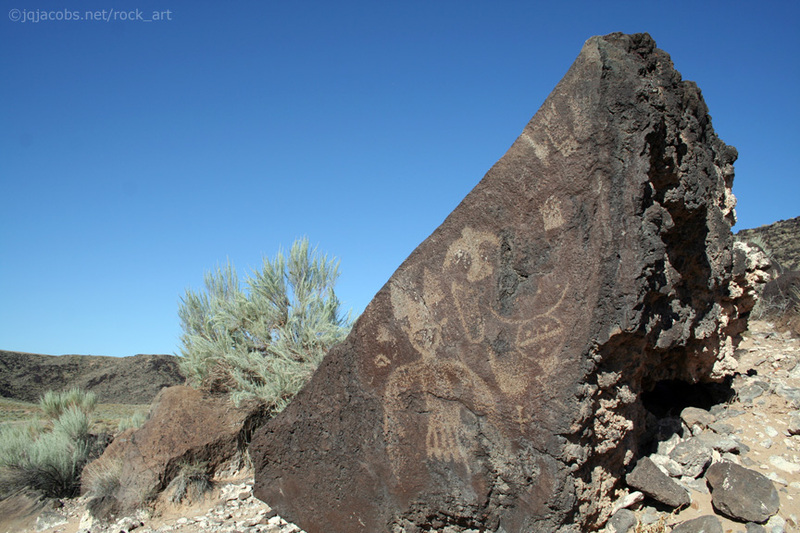 Sometimes petroglyphs are painted or accentuated by polishing. The degree of repatination indicates relative dating. 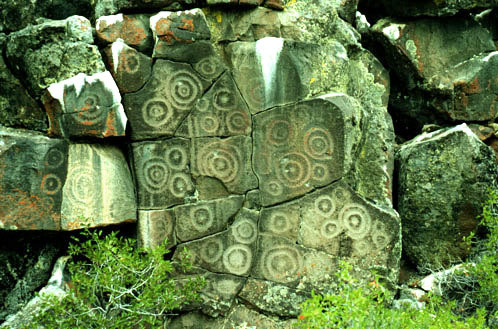 Some of the most ancient petroglyphs are the same color as the surrounding rock. Dating inorganic paints and petroglyphs is difficult. Styles are one useful indicator of antiquity. One of the oldest styles in eastern Utah, Barrier Canyon Style, is associated with the Archaic culture. The Great Gallery in Barrier Canyon, Canyonlands National Park, is the type site. Features distinct to the style include tiny birds flying about the heads or tiny people and animals perched on the shoulders of life-sized or larger anthropomorphs. The anthros are typically painted in monochrome reds and browns, are often elongated and have diminutive or no appendages. The Great Gallery anthropomorphs have decorated torsos with a great variety of patterns, including animals, miniature anthropomorphs and geometric designs. One of the largest figures, the singular seven-foot-tall Great Ghost, was painted by spattering, resulting in a seemingly transparent image. Three pages dedicated to Barrier Canyon Style follow this page after a page about Pecos River Style. Although these pages generally focus on the Colorado Plateau, Pecos River Style has affinities with Barrier Canyon Style and a page is therefore here included. Pecos River Style has been accurately dated to about four millennia ago. A culture labeled Fremont, dating from about AD 500 to 1300, followed the Archaic in most of eastern Utah. 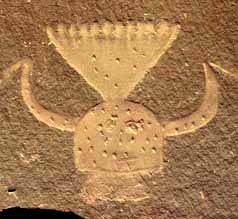 In southeastern Utah Puebloan culture developed from the Archaic with influence from the Hohokam and Mogollon cultures to the south. Permanent dwellings and corn and squash agriculture distinguish these later cultures from the Archaic. The earliest Puebloans are termed Basketmaker by Richard Wetherall after he unearthed many skeletons associated with high quality woven baskets in southeast Utah caves. Late sequence cultures are termed the Pueblo I-IV cultures. 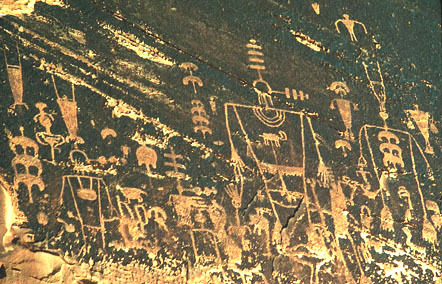 The vast majority of Colorado Plateau rock art is attributed to the Fremont and Puebloan cultures. Following the three Barrier Canyon Style pages three pages with Fremont Styles of art follow and then four pages with Puebloan art. Fremont culture is less complex than Puebloan, yet some of its rock art is artistically finer and highly regarded as artistic expression. Fremont Style features broad-shouldered trapezoidal anthropomorphs with elaborate decoration. Stylization includes dot decoration, bucket head shapes, tear streaks, arm bands, earbobs, necklaces, headdresses, torso lines and deletion of body outlines. Prominent abstract elements include spirals, concentric circles, wavy lines, circles, and dots. 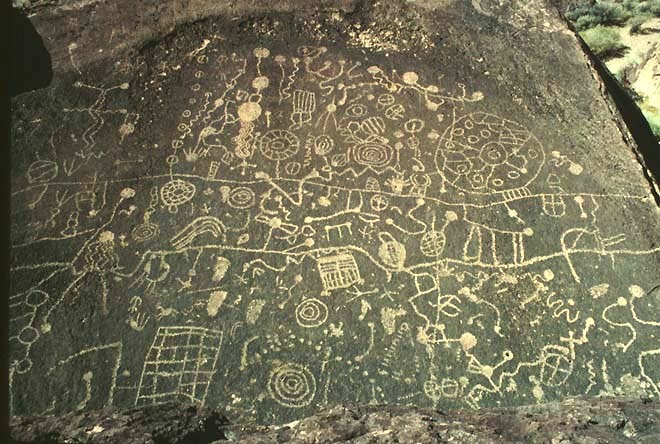 A Classic Vernal Style Fremont panel on Dry Fork, north of Vernal, Utah, has been rated as the world's finest petroglyph panel. The elaborate group of life size anthropomorphs includes a negative figure, painted areas, polished areas, dot group decoration and a deeply incised perfect circle. Some of the dot group tallies correspond to the proportions of solar system periodicities. Rock art is an important, little studied and often very vulnerable cultural resource. Uncounted sites have been lost and destroyed by reservoir, railroad, road and subdivision construction, rock quarrying, and livestock grazing. Canyons suitable for dam construction are often also excellent rock art and habitation sites. Inundation has covered some of the best concentrations. Glen Canyon dam inundated more than a hundred miles of the Colorado River and many miles of tributaries. Dozens of other reservoirs in the water thirsty west cover rock art and antiquities. Laws protect some rock art on public lands. On private property owners can make gravel of panels if they wish. Some of the most impressive sites are privately owned. Most accessible roadside sites have been vandalized, usually with bullets or by individuals inscribing self memorializing epithets. Erosion, both natural and visitation affected, takes a toll, particularly so in the very sensitive desert ecology. 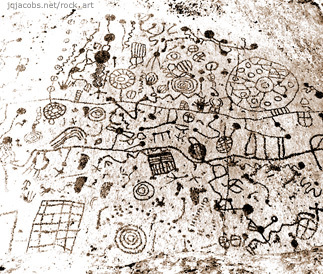 Acids in rain originating in distant urban/industrial centers can affect rock art. Study of sites has even damaged panels. Chalking, rubbing, wetting, tracing and labeling has often irreparably altered panels. Repainting by movie makers has occurred. Petroglyphs have been cut out and removed for fireplaces and mantles. 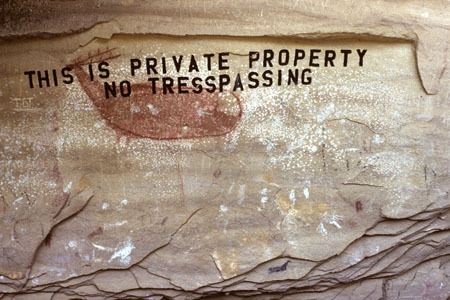 In Nine Mile Canyon the best pictograph panel and the most extraordinary elk pictograph on the planet is superimposed with bold letters of modern paint reading, "NO TRESSPASSING THIS IS PRIVATE PROPERTY." Knowledge of spelling is not a vandalism prerequisite. Contemporary site stewardship ethics prohibit altering or even touching the glyphs. Unlike pottery and basketry, rock art must remain in the wild, a unguarded outdoor museum susceptible to the elements and to the species that created it. Ironically humans represent the greatest danger to rock art sites. Pictographs in European caves have endured for 25,000 years. Today rock art destruction is occurring at a rate that makes natural attrition seem harmless. The destruction wrought in the 20th century has probably outpaced the most productive era of rock art creation. Only the utmost care and respect can preserve our wild museums for future millennia. The NEXT link below leads to the Pecos River Style page, then follows the first of three Barrier Canyon Style pages. Sheep petroglyphs in the Dark Angel area of the Devils Garden, Arches National Park, Utah. 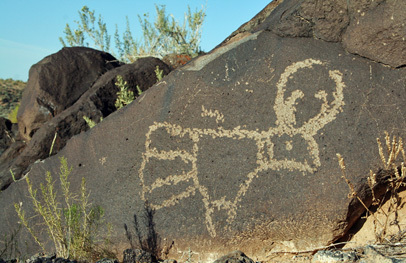 Fremont Style petroglyph panel in Nine Mile Canyon, northeast of Price, Utah. 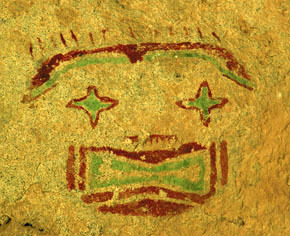 Pictograph mask at Hueco Tanks State Historical Park, east of El Paso, Texas. Possible mastodon petroglyph panel detail near the Butler Wash - San Juan River confluence area, Utah. 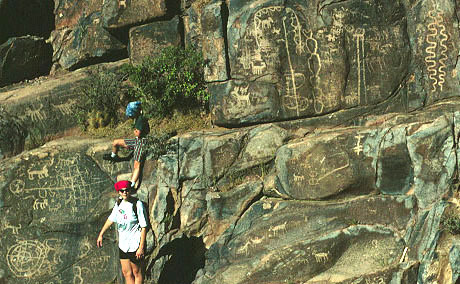 Portion of the petroglyphs at Hieroglyphic Springs, east of Apache Junction, Arizona. 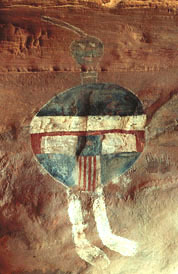 View of Newspaper Rock petroglyph panel on Indian Creek, southwest of Moab, Utah. Your comments and inquiries welcomed. Contact.